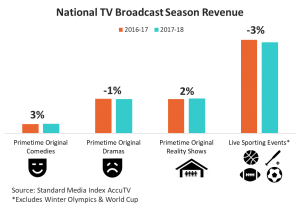 SMI Releases Full Season Data Using Enhanced AccuTV Powered By Nielsen Ad Intel Standard Media Index, the most trusted source of ad pricing and revenue data, unveiled national television figures for the 2017-18 Broadcast Season. This month marks start of our updated version of our AccuTV product. With this advancement, we are expanding coverage and improving accuracy through a new relationship with Nielsen Ad Intel. Using SMI’s real prices paid on spots and combining with Nielsen Ad Intel occurrence data, SMI models out 100% of spots in the TV marketplace across 125+ networks. This development brings the addition of 50 networks, the inclusion and breakout of Promo/PSA ads, and enhanced pricing methodology at the telecast level. SMI and Nielsen are thrilled to combine forces for this. Kelly Abcarian, SVP, Product Leadership at Nielsen has said “By fostering this relationship, SMI will now be one of the most comprehensive and complete sources of advertising intelligence available in the market and will be able to unlock the power of these insights across the broad media landscape in an accurate and unprecedented fashion as a way to drive client value.” Data from the new and improved AccuTV shows that during the full 2017-18 Broadcast Season, excluding the quadrennial Winter Olympics and World Cup, National TV maintained revenue of $45.5 Billion. This is the same as the prior year, despite declining audiences and continued pressure from Digital. “As the industry faces chord cutting in record numbers, much of the discussion has been around TV Networks’ new Digital offerings; nevertheless, the continued value of linear cannot be ignored,” said James Fennessy, SMI CEO. 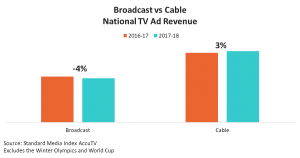 “This is especially true for Cable networks, which are growing in revenue.” Broadcast vs Cable The 2017-18 season was better for Cable networks, which grew revenue 3%, while Broadcast fell -4%, when excluding the Winter Olympics and World Cup. Interestingly, ad loads – or the number of 30-second equivalized spots – increased this season, despite several networks recently announcing plans to reduce ad time. Overall, ad loads grew 4%, with an 3% increase from Cable and an 8% increase from Broadcast. By the same token, the overall number of unpaid spots – also known as ADUs or makegoods – declined -1% from the 2016-17 season. Primetime Original Programming Among Primetime Original Entertainment, Comedies are laughing their way to the way to the bank. Primetime Original Comedies saw 3% growth this year. This genre got a lift as high-profile reboots and spinoffs commanded higher prices than other sitcoms. Specifically, Roseanne on ABC, Will & Grace on NBC, and Young Sheldon on CBS were all among the top 5 most expensive primetime original comedies during the season. Meanwhile, revenue from Primetime Original Dramas slipped -1% this season. However, despite the decline, original dramas brought in more than three times the total revenue of original comedies. Primetime Reality Shows also saw a bump of 2% this year, especially during the broadcast month of September. That month included the finales of American Ninja Warrior, So You Think You Can Dance, Bachelor in Paradise, and America’s Got Talent, as well as the premiers of Dancing with the Stars and The Voice. Altogether, Primetime Reality Shows grew 30% YoY in September. SMI defines original programming as non-syndicated, new episodes for comedy, drama, and reality subgenres. Live Sporting Events Live sporting events dominated television during the 2017-18 season, thanks to the addition of the World Cup and Winter Olympics. The two events brought in linear television revenue of $234 Million and $748 Million, respectively. With the insertion of nearly a billion dollars into the marketplace, Sports saw an overall increase of 7% this season. Excluding those two events, live sports games earned $7.9 Billion, down -3% YoY. Market Share Comcast Corporation takes the lead in market share this season with 21%, well ahead of number two, The Walt Disney Company at 15%. Comcast had a terrific year, with NBCUniversal properties airing both the Olympics and the Super Bowl. Discovery Inc., which formed during this Broadcast season after the merger of Discovery Communications and Scripps Networks Interactive, has become the second largest TV Network Group in the Entertainment vertical, comprising 15% of the market. 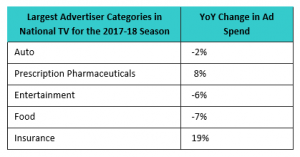 Advertisers by Category Within National, the Auto industry spent the most on advertising in this season, although that figure declined by -2% YoY. The next largest spenders were Prescription Pharmaceuticals (8%), Entertainment (-6%), Food -7%, and Insurance (19%). About Standard Media Index Standard Media Index is the most trusted source of advertising pricing and spend data in the marketplace. SMI accesses actual invoices from the world's largest media buying groups, as well as leading independents, and then organizes that data to create a clear, granular, and easy-to-use database for our clients and agency partners. By aggregating this data, which accounts for 70%+ of all agency spend, SMI offers detailed ad intelligence across all media types, including Television, Digital, Out-of-Home, Print, and Radio. Data can be broken down by ad types, publishers, product categories, and other dimensions. Our data supports insights covering 32 countries around the world. For more information and resources visit www.standardmediaindex.com. Methodology SMI sources our data from the raw invoices from the media agency holding groups to see the actual dollar amounts spent on each ad buy. We work with 5 of the 7 major media holding groups and leading independents – making up 70% of the National TV market. Using SMI real prices paid on spots and combining that with occurrence data from Nielsen Ad Intel, SMI models out the full 100% of the spots in the TV marketplace within Nielsen’s coverage. Market share percentages are comprised of the approximately 130 national TV networks we measure.